The Presidential election this past fall was a pretty heated race between President Obama and politician Mitt Romney . Our student Tyrell Lee'16 recalls the night of the presidential election countdown at home as nerve racking and exciting. He wanted President Obama to win and indeed the votes came out another victory for President Obama. On Friday January 18th, 2013 Tyrell along with his uncle, grandmother, and four other cousins drove to Washington D.C. to join President Obama on his Inauguration on January 21st, 2013 (Martin Luther King Day). This was an "Extraordinary experience," said Tyrell. They were relatively close to the actual Inauguration celebration and Tyrell was able to see many celeberity and politicians. 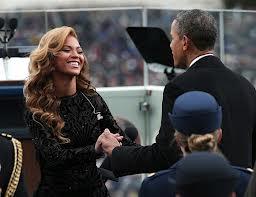 Some of those he recalled seeing was both candidate Barack Obama and Mitt Romney, the First Family, and Beyonce. As the Inauguration came to a close Tyrell returned to Minneapolis with the message that if you have a dream, follow it, because anything can come true. You can do anything if you set your mind to it. Life is special and you should not waste it. The Inauguration left Tyrell inspired to change himself, to make his life more meaningful, and become successful at reaching his dreams and goals.